Hay Hay! It's Donna Day #5! is being hosted by Running With Tweezers with the theme of savoury tarts. Hay Hay! It's Donna Day is the brainchild of Barbara of Winos and Foodies, it is at it's fifth iteration, but only the first I have successfully managed to enter on time! A few ideas came and went for this round : a quiche, a pie, but when I got home last night and had the urge for a vegetable packed dinner I decided to make a vegetable pie. And to make it easy I thought I would try out a free form tart style. For some reason I have shied away from a tart made without the safety of a tin simply because I was afraid it would just collapse during the cooking. So imagine my surprise when not only did it not collapse, but turned out to be the crispiest, most perfectly cooked tart I have made? 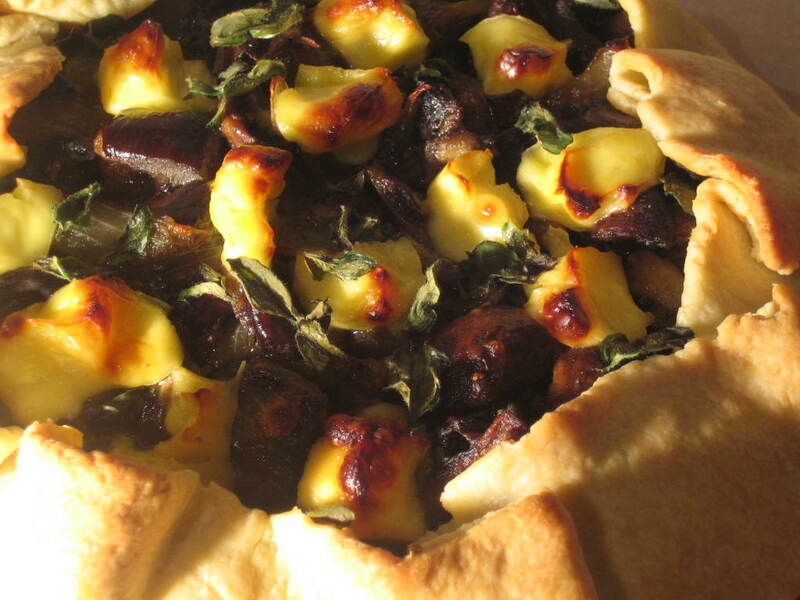 It must have been that the air could circulate so freely around the whole tart. Toss together all the ingredients for the filling except the feta and marjoram and bake for about 30 minutes or until cooked and sticky and fairly dry. Set aside to cool. Pulse the butter, flour and salt in a processor until it resembles course crumbs. Add iced slowly water until the dough just starts to come together. Tip out onto the bench and bring together into a ball. Wrap in plastic and rest in the fridge for at least 30 minutes. Roll out the pastry to approximately 1/4 centimetre thick into a rough circle on a piece of baking paper. Tip the filling into the middle of the circle and spread out slightly to an even layer, staying away from the edges. Crumble the feta and marjoram leaves on top. Fold the edges of the pastry up to form a shell. Rest in the fridge for at least 30 minutes. Bake for 40 minutes, or until the pastry is crisp and golden Cover the exposed filling with a piece of foil during the time if you feel it is browning to quickly, removing for the last 10 minutes. Cut into wedges and enjoy with some steamed greens or a crispy salad. Looks and sounds delicious Emma. Great you made it on time. Even before I've done mine! i love free form tarts like this. i make a nectarine and blueberry version with a sweet crust like this - yummy. This looks fantastic. Did you use one of those long thin Asian aubergines or an Italian one? I have two Donna Hay books with similarly wonderful looking photos. I'm ashamed to say that I've never made anything from her books though. I really MUST try actually making some of the recipes! Mmmmm - how can I resist a tart that contains all of my favourite ingredients?! That looks seriously good. I woudl also have been to scared to go the free-form route, but encouraged by your runaway success, I may give it a try! I like aubergines but always have trouble cooking with them. 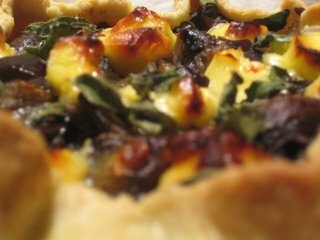 Your freeform tart looks super, very rustic. Thanks you guys! I just used a regular (I'm guessing Italian) aubergine. I think that the only thing that makes aubergine nasty is undercooking it, so maybe that is the problem Brilynn. As as for the free-form risk Jeanne, go for it, I was surprised! This looks absolutely mouth watering. I love the combination of aubergine and mushrooms!